This is a well-priced oil less piston air compressor with AUTO-STOP. 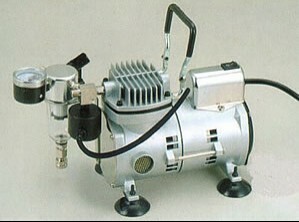 (The compressor switches off when the airbrush is not being operated). The unit comes complete with a 10' baffle hose, airbrush hose that fits alll Sparmax airbrushes (also compatible with Iwata and other popular Japanese Airbrushes. A 1/4" adaptor is included for American and European hose) and a moisture trap. Nothing else to buy, just hook up your airbrush.